Constant Beamwidth Broadband Beamformer provides constant spatial discrimination performance across the full band of the beamformer. VOCAL’s Constant Beamwidth Frequency Domain Broadband Beamformer software solution provides constant spatial discrimination performance across the full frequency band of the beamformer. Our beamformer software is available as a standalone algorithm or library. Custom designs are also available. Please contact us to discuss your beamforming requirements. 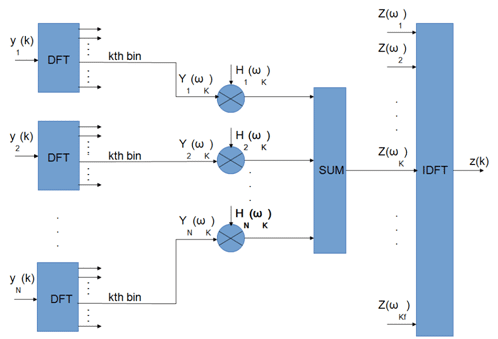 Constant Beamwidth Broadband Beamformer improves upon a typical microphone array Delay and Sum beamformer which has a beamwidth inversely proportional to the source signal frequency. Using this type of narrowband beamformer for a broadband source signal such as speech would cause the signal to be low pass filtered whenever the beamformer steering direction is different from the source signal incident angle. A “spectral tilt” artifact is caused by noise and interference signals not being attenuated normally over the spectrum of the beamformer output. A solution to this problem can be realized by considering a beamformer in the frequency domain and designing narrowband beamformers at discrete frequencies of a discrete fourier transform (DFT). The output of the Constant Beamwidth Broadband Beamformer is derived from the narrowband beamfomers using a filter and sum technique. The filters are derived to generate constant beamwidth beams over the full spectrum of the beamfomer.